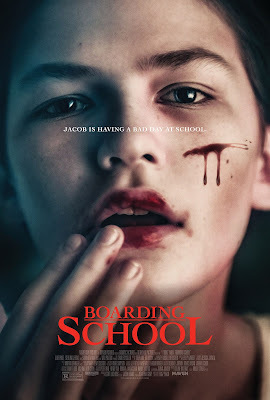 Boarding School is a horror movie starring Luke Prael, Sterling Jerins, Will Patton, and Tammy Blanchard about a young, outsider named Jacob (Prael) who is sent to a boarding school for misfits where he uncovers dark secrets about the institution and the people who run it. The thing that this movie has going for it above all else is its unconventionality. They take stories that we've come to know, those revolving around misfits and boarding schools, and add a nice spin of unpredictability to it that is refreshing. As things begin to unfold you think that you have everything figured out; it's this creepy boarding school with sinister motivations for its inhabitants, but it's also more than that. I also found the performances from everyone involved to be commendable. A good chunk of the movie centers around these young, misfit characters. I think that it could've been really for these young actors to be too over the top with their characters to the point where it comes off cartoonish, but I think that they all did a great job of grounding themselves especially Sterling Jerins who plays The Bad Seed-influenced and psychotic Christine. Where I believe this movie does flounder is in its sub-plot surrounding Jake's grandmother. In the beginning of the story we find out that his grandmother, whom he has never met, has died. One afternoon while he's alone, he starts going through his grandmother's belongings: playing old records, trying on her clothes, and looking through old photographs. What it feels as though they are attempting to propose with this story initially is that she is haunting him and that there is this unspoken, eerie, and familial connection between the two. Other than the wrap-up at the end I felt like that sub-plot's connection to the larger plot could've been tied together better, the whole thing just felt incredibly underutilized. There was also this sense of ambiguity that surrounded Jake's gender expression that while I can see some considering it to be another flaw of the film, I didn't necessarily have a problem with. While it would've been nice to see it explored more, I also think that it makes sense as to why it isn't. Jake's expression of gender norms is something that, while I'm sure he has had thoughts about before, we can at the very least assume he hasn't really explored it in the way that he is now at this point in his life; he's attempting to make sense out of all of it, and in Jake's attempt at understanding what he is instantly drawn to there isn't going to be this definitive judgment or answer to the questions that it raises. This was a movie that definitely exceeded my expectations. Though, I felt like the horror element could've been played up more, overall this was a fun watch that kept me guessing from beginning to end.